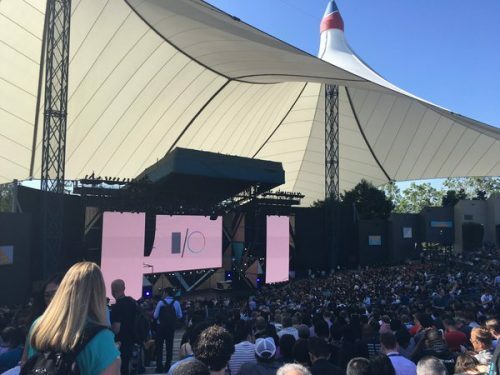 Matt visited Google I/O yesterday, and sent back some pretty incredible pictures. This event looks more like a music festival than a tech conference. He was sending pictures and excited snippets of text back to Pi Towers all through the event, and then, when he got home, shared this video. I’ve been so excited about it that I’ve had it playing on repeat, and we all thought you’d like to see it too. 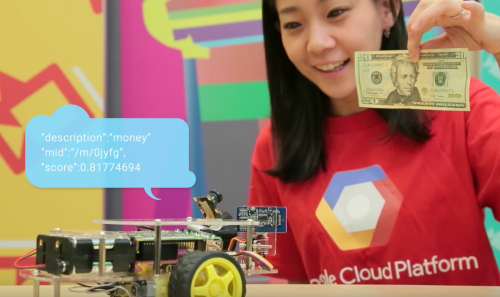 This is a demo of a Raspberry Pi robot working with Google’s Cloud Vision API – and it’s got such potential for your projects. Cloud Vision API provides powerful Image Analytics capabilities as easy to use APIs. It enables application developers to build the next generation of applications that can see and understand the content within the images. The service enables customers to detect a broad set of entities within an image from everyday objects to faces and product logos. The robot is taking pictures and sending them to the cloud, where they’re analysed and sent back in real time. There’s facial detection – along with detection of what emotion is showing on those faces. And cloud vision offers you image recognition, so you should be able get your robot to distinguish limes from green apples. You can then get the robot to act on that data – so you could set it to gather apples and not limes, for example. We’re pretty excited about the opportunities this API offers makers of all kinds of Raspberry Pi devices. You can learn more here – please let us know if you start integrating it into your own projects! That is a great looking robot! I had to re-view the pictures after your comment. For a moment there I thought the one in the red shirt is a fembot. With all the talk about fembots. But you were likely talking about the one carrying the circuit boards. I wonder how good it is at identifying the number of chickens there are in a picture? I could finally automate the door closing of my coop by having the system count the number of chickens it sees to make sure they’re all in before closing the door! But somehow I think it’d have trouble with that. I imagine you could already do something like that with OpenCV. Perhaps you should check out PyImageSearch, haven’t started it yet, but he has a 10-day crash course in OpenCV. I need one built to recognize what I pick up and tell me to step away from the Twinkies/doughnuts/etc. The session at Google I/O also covered the new Speech API (for live speech-to-text transcription). Here’s a video of the full session: https://www.youtube.com/watch?v=HpPyhsC4q9M It gave me so many ideas for projects. I hope I can find some time to try those APIs out soon! Amazing. Are they open-source? If the APIs are open-source, then I am really happy. Also, a tip to Raspberry Pi, the Pi Zero link on the Products page to Micro Center pops up the old board, not the new one. I will implement Google’s Cloud Vision API into my Raspberry Pi powered robots. Thats sound very cool to build a garbage collecting robot. They could at least have bought a genuine Pi camera instead of a Chinese clone! Looks like it’s got a great lens on it, where you think they got it? Which tts engine was used here? Can’t access the Google Cloud Vision page, right now, but it’s interesting to notice that some of it was announced two months ago. Maybe it’s just a shift in my own personal frame of mind but it sounds like the most exciting stuff is happening in the learning, making, tinkering, and tweaking space. Mega Corporations like Amazon, Google, Apple, and Facebook may announce neat things but it’s only when people find new ways to put these things to use that actual innovation happens. So, the good news would be about the opening up, not just about the fact that they’ve been able to recognise twinkies and hens. There’s quite a bit of excitement around OpenCV and Le myope was a cool demo of where the tech can lead us. In a way, making these things work on RasPi show something of the future of computing: more experimentation, more appropriation, more collaboration between Mega Corporations and regular human beings. At least, some of us are quite excited about the possibilities. Although this has been out for a few months the sample code is lacking to create what is shown here. It would be nice to see the sample code.